– Hello, Stephen. How would you describe this set of images? – Unexpected! Honestly, these aren’t photos I would’ve chosen to show off my work. Perhaps at one point, but not now. So I suppose I could easily turn this question around and ask why you chose them. – I chose them because I like them and I like how they stand together in this set, these are some of my favorite images from your Flickr collection. Your most recent works are more focused on people, I prefer images where architecture and urban elements are playing the main role. 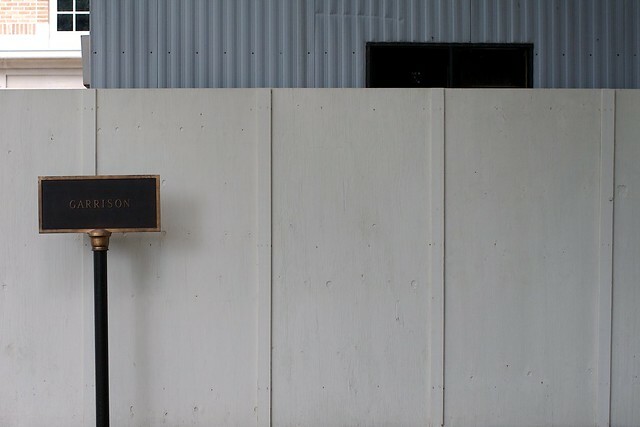 GARRISON CONSTRUCTION OFFICE: Wow, I’m not sure I really like this one. Clearly an early work, but it does show my interest in nothingness and what was my mainstay at the time – flattening out the 3d world. I used to purposely shoot a lot of these flat, rectangular compositions. Mostly walls. Often with a layering effect. I would refer to it as putting a frame around some random piece of the world and calling it art. The idea is that any view of the world is just as good as any other. 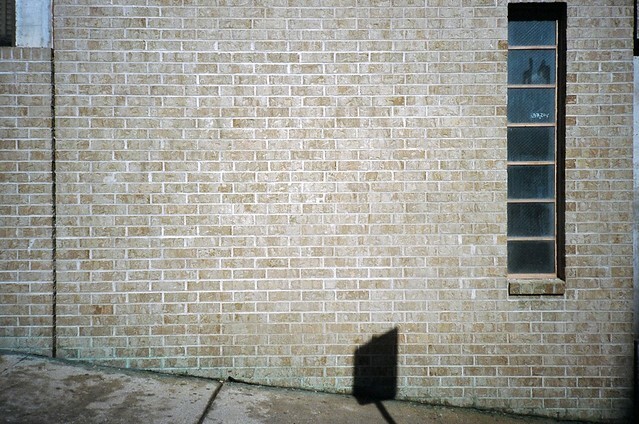 Basically a combination of Eggleston’s democratic camera and Zen. – It needs a good eye to notice this kind of scenes, I admire the graphic quality of this photo, details and how everything perfectly fits together. I wouldn’t really call this style nothingness, because that term associates me to something like ‘meaningless emptiness’. I would rather call it urban minimalism, because it shows the simplicity of urban scenes at its best, which certainly means more than ‘nothing’. With this kind of photography the accent is on geometric compositions and details with a special character, that are much more difficult to find than it seems. SEATED: This is actually a favorite, largely because it’s serendipitous nature. The best thing about carrying a camera most everywhere I go is that it allows moments like this to happen. This also features two other things I enjoy. Shadows and randomly personified objects of an object. I love shadows, because they allow you to show an object, without showing the object and in a sense are illustrations in and of themselves. Also humans love to see themselves in non-human things—objects, plants, animals, etc. People always point such things out to me in my photos, whether I mention them or not, often going so far as to ascribe emotions or motive to the object and I find that interesting in itself. So to see the shadow in effect sitting on this bench in the morning sun is like a two-for-one special. – Shadows are ‘moving illusions’, if you were at the same spot at some other time the scene would have looked rather different. 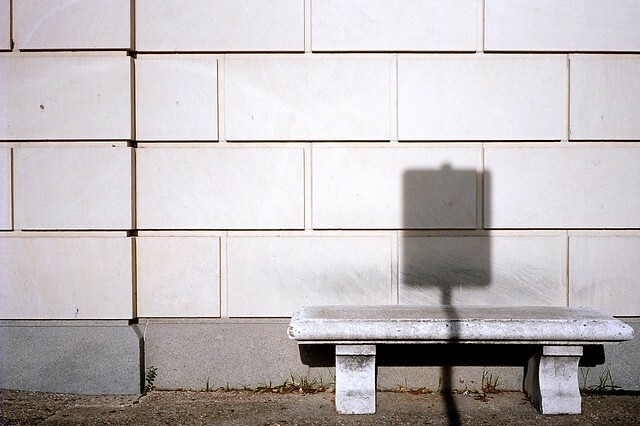 The shadow on the bench is indeed giving this image a special touch, but I also like that vertical line on the left side that adds some optical weight to the photo and keeps all elements perfectly balanced. WALL WITH SHADOW AND DOWNSPOUT: Didn’t really like this one when I took it, but for whatever reason it didn’t get deleted. It just hung around my personal archive for until I made something of it. This is actually a pretty severe crop of what was originally shot. Don’t remember what was in the original that I hated so much. It’s more nothingness–minimal nothingness at that-with a nice interplay between what’s there (the downspout) and what’s not (the shadow). – You were in the right place at the right time, it’s amazing how the shadow of electricity cables got connected to the rain-pipe and pointed out to that spilled water spot on the ground. SMALL SHADOW: More minimalism and shadows. Exploring minimalism and asking how little of the subject can be in the photo and it still be a photo of the subject? The answer: very little. – Yes, ‘very little’, but that ‘little’ must have a strong character. Besides a very special shadow I also like that almost-horizontal line of the pavement, which is a great detail that breaks dimensional flatness of this image. TRIO: This subject has become one of my minor obsessions. I’ve taken a lot of photos of these pillars, either singularly or in this grouping over the past couple years. They’re just random objects that I’m trying to turn into an art installation via the camera. I think it works. – Yes, it does indeed. I admire the light and composition, the texture of pillars is also very nice. ILLUMINATED AFTERNOON: At some point my obsession with shadows morphed into an obsession with what you could call anti-shadows. For me it’s generally about the contrast between the areas of light and dark and how the light paints or illustrates in the same ways shadows do in other photos. This one also makes a nice scene as I got lucky with the cone. – Perfect timing, a great detail and excellent crop. Urban minimal at its best. – Well, it’s there. Not to be clever, but I live in the middle of a mid-sized American city (Austin, TX) and I don’t drive (due to poor vision), so this is what I have to shoot. I suppose if I lived off in the country or could travel more easily, I’d be shooting different things. In general I’m interested in what’s around us the mundane things we take for granted or don’t notice. That fact that you can easily go out and draw a rectangle around small views of the world and say, “This is now art.” Specifically, architecture and the urban environment offers many of these views. They provide an endless variety of shapes, patterns and textures to work with. What attracts my attention is basically the phrase, “is this anything?” It’s almost like a game I play with myself. I’ll look and something and ask, “is this anything?” Maybe I’ll then look through the viewfinder and ask the question again. Look at it at home on the computer and ask myself again. If the answer keeps coming up yes, then the photo eventually sees the light of day. And yes, I do see the irony of the question when I talk about my subjects often being ‘nothing’. I suppose nothing can equal anything. 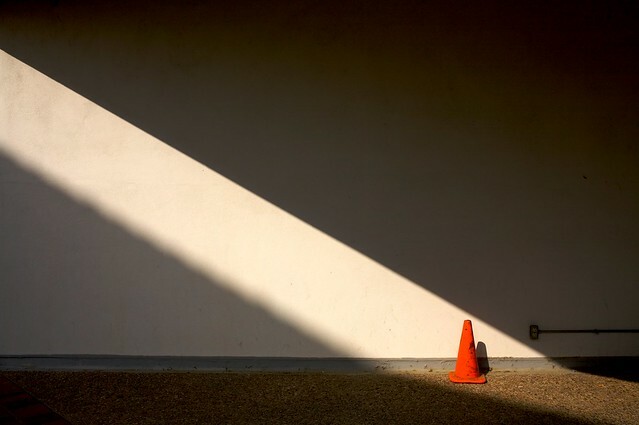 – As far as shooting goes: I enjoy street photography as well as more minimal, abstract things as well. (My tree/sky series being abstract-minimalist-nature photography.) I suppose they’re both related to the topic at hand, but run off in opposite directions. As far as viewing goes: Pretty much anything. I love all styles of photography, except the stuff that’s too affected or starts heading off into the world of digital art and CGI. – Motivation is simple: I have to. I’m pretty much obsessed with or even addicted to shooting and when I don’t or can’t for a stretch of time I tend to become difficult to be around. As far as goals go. I used to have some fairly set goals (books, galleries, etc. ), but I found they were not realistic with the time and resources I had available. For now I’m just doing it for me and if people see and enjoy my work, all the better. – No, not really. I suppose I could do what I do in any city. I got to shoot in New Orleans last fall and that was a lot of fun for me. The first time I’d spend a significant amount of time with a camera outside of Austin in a long time. That said, if there was somewhere I could go tomorrow, it would probably be Tokyo. It just seems like it would be like Disney Land for photographers. – I have/have had a lot cameras, so that’s not an easy question. I currently have about seven cameras to choose from on a daily basic and they all seem to have their good and bad points. The reason I have so many is that I’ve found that different cameras tend to effect the way I shoot. It’s like each wants to be used in a specific way. So I just have to say, “okay” and do what it wants. Recently, I picked up a Leica M7 (used—of course!) and am still getting used it. So ask me this question again in a couple months. I also post photos or have a presence on the following sites: Flickr, Facebook, Posterous, Twitter and on my website. – Thank you, Stephen and all the best with your photographic work. A quiet and balanced view, that is always my first response to Stephen Gray’s images. but also a stubborness, which I can’t explain, but like very much, even if Stephen feels that this is not true. A lovely collection. Both of you congratultions. I also like what he says about motivation: I know the feeling of ‘have to’! I like this approach of the light and of the shadows, a mysterious interplay. A fantastic selection. Congrats to both of you! Very beautiful series, xgray ! very good choice, Brancolina! well, I didn’t know this photographer, and so what I can say first is – thank you very much for introducing me to his work! Thanks to everyone for their comments. They’re much appreciated. Quite a set… nothing might be “going on”, but for certain something is happening in each. hehe! “Illuminated” is very special… spacial. High quality images representing a well composed and elegant type of minimalism. 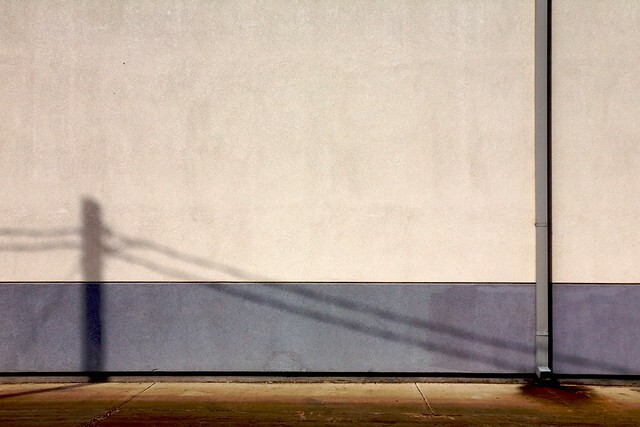 Excellent work with shadows and spaces! I am very familiar with xgray’s work and have many of his images in my favorites pool. His work struck me immediately. There were the obvious things like beautiful tones, always fine minimalism and infallible talent for composition. It’s also obvious that he “get’s” the value and importance of what to leave out of an image. 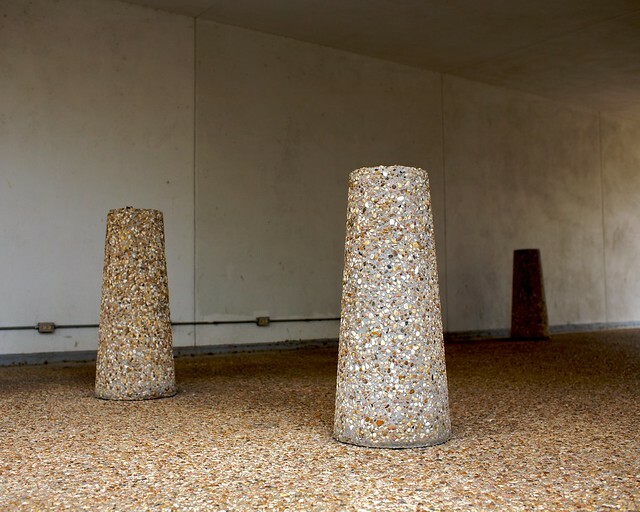 I really love the dry humor in his work – polymorphous lamposts and shadows etc. Finally, I understand the references to Eggleston and such but when I view Stephen’s work I think of Samuel Beckett’s – elegant, beautiful with a healthy dose of the humor found in life’s absurdity. Ich glaube, dieses Zitat passt gut. I think this quote fits well. Everyone can shoot. Even a machine. But not everyone can watch. Photography is art only insofar as his is the art of observation served. Observation is an elementary poetic process. The reality is shaped required in order to make them talk. great combination of light and graphic quality! I think this is urban poetry in a fantastic way. Great selection!